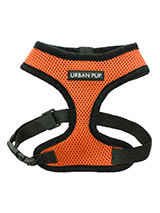 Our soft mesh dog harnesses are the perfect walking accessory for your pup. Designed to provide the ultimate comfort and safety, they have also been made with a breathable material to allow maximum air circulation, helping to prevent your dog from overheating during a long walk. Held together by a secure yet easy-to-put-on clip, this accessory is available with a matching lead to complete the outfit and make sure your dog is the best looking in town. The soft, padded breathable side of the harness covers the dog's chest and the lead clips onto the D-ring between the harness' shoulder blades. 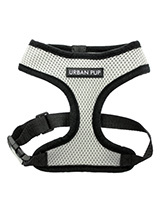 This soft mesh harness is the best choice for you and your pup to reduce pressure on your dog's neck and prevent chafing and strain on the joints caused by a traditional harness while walking. 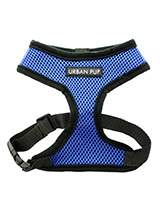 Our soft mesh harnesses are available in a variety of colours and sizes to fit any age or breed of dog. 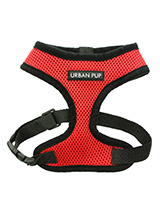 Here at Urban Pup, we pride ourselves on being able to provide everything that your pup needs to be the best dressed in town. Whether you need a full outfit, or something more practical such as our soft mesh harnesses, we have everything you want at great prices. 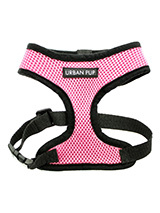 All of the dog clothes available on Urban Pup have been selected from top designers in the dog fashion world, and have been styled so that they are easy to put on, take off and stay on during activities such as walking or play. If you have any questions about our soft mesh harnesses, or have any other general enquiries, please don't hesitate to contact us today.